Q. 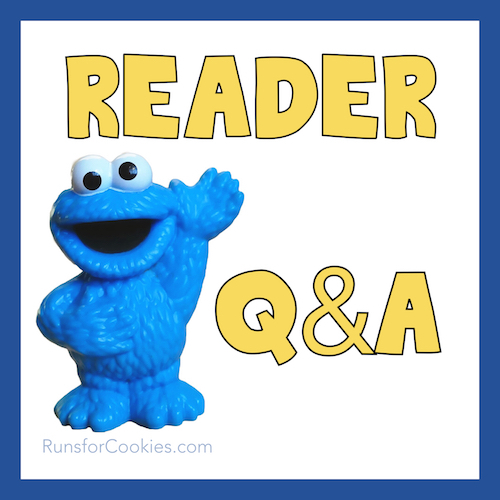 How did you prepare for the half-marathon that you walked? A. 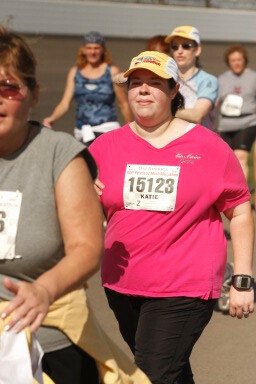 The first half-marathon that I walked (my first race ever, actually) was the Indianapolis 500 Festival Mini-Marathon in 2008. I had no idea what to expect, but my sister had walked one, and told me I could do it if I trained for it. She stressed how important it was to train, because I would be really sore if I didn't. In retrospect, I should have listened ;) I was very overweight at the time I registered (probably about 215? This was after losing some weight). I guess I assumed that walking was "just walking", and anyone could walk 13.1 miles. I did about 2-3 training walks of a few miles each in the fall--and nothing else until the race in May. Very bad idea! I was miserable the entire time, my legs and feet were absolutely killing me, and I could barely walk back to the hotel afterward. It didn't get any better, and I went to a podiatrist when I got home. He said I had pretty bad tendonitis, and I wound up in a walking cast for a few weeks. I registered for the following year's race, but made sure to train for it. So to answer your question, I followed a training schedule by Hal Higdon for walking a half-marathon. I was so worried about screwing up my feet and legs like I had the previous year, that I made sure to follow it to the letter. The first week of his program has a three-mile walk for the long walk day, so you should be able to do that before you start the program. If you can't walk three miles yet, I would build up to that first. Hal's training plan is 12 weeks, so I would count backwards from your race and pick the date to start the plan. I think throughout the whole schedule, I missed only a couple of walks. I made SURE to get in the long walks once a week, but if I had to miss a shorter walk once in a while, it wasn't the end of the world. Q. Am I the only one that keeps slicing her legs while shaving because I'm not used to the bones? A. This question made me laugh. I'm not sure if it was hypothetical or not, but I wanted to respond. I've not had that problem with my legs (my legs are anything-but bony! ), but I remember the day I discovered why armpits are called armpits. This is probably way more than you wanted to know about me, but when I was heavy, my armpits weren't really "pits" at all--they were flat and very easy to shave. But when I had lost a good chunk of weight, probably about 80 pounds or so, I noticed that my armpits were concave and much harder to shave! Then it dawned on me, "Ohhhh, that's why they are called armpits. Duh!" "Last year, I participated in a summer internship with the Make a Wish Foundation. I found that many girls fighting childhood cancer lose their hair during their rigorous chemotherapy treatments. I realized that headbands are the perfect way for these girls to keep their feminine identity and have a constant reminder that they're not alone. For girls and women everywhere, their hair is a part of their feminine identity. Wigs can be uncomfortable and unappealing, especially to younger girls. Therefore, I started Headbands of Hope. For every headband purchased, one headband will go to a girl with cancer and $1 will be donated to the St. Baldrick's Foundation to fund life-saving childhood cancer research. Headbands of Hope provides a movement to spread hope in all girls and fight in the battle against childhood cancer, one headband at a time. We have a glitter athletic band line that would be perfect for your readers. I'm a runner and I run in them all the time!" Jessica wrote on her blog about how the idea for the headbands came about--just beware, I sobbed while reading it! I've never had armPITs. I had to laugh because I've never thought about that either! Looking forward to the day when I will have armPITs. I too cried like a little baby reading her blog. It is a wonderful program and I have decided to order one of the white headbands to wear for my wedding as a reminder of those beautiful little girls who may never get that "dream wedding" and hope that someday cancer may never take another child. Thank you for bringing exposure to this program. The armpits comment is too funny! I have 2 little girls(5 & 2) the 5 year old with like 2 feet of hair. and when I read the headbands for hope, I cried like a little baby. I read her blog post and cried. Then later that day while I was out running with my mom I told her about this blog I read, and we both started crying. While running. I will tell you, running and crying dont mix. Thanks for sharing about Headbands of Hope! Such a cute idea and I will definitely be buying something! Looks like you learned the hard way how important training is! Lol on the armpit con-cave!! That's exactly how I felt around the time I lost 80 lbs!! I was like man it is so freaking hard to shave them now!! I like the idea about the headbands! The headbands are so cute and what a good cause! Hi Katie, Since I'm reading your blog at work, I basically just scanned the article about why they started the headbands, because I cry easily. But I still have tears in my eyes thinking of that sweet little girl and her love for Sleeping Beauty. Nothing is sadder than an ill child. You were very brave to sign up for the race the second year after the first time hurt so badly. I think that's why you've done so well with your running and keeping your weight off--that determination you have always had--even back when you were overweight! I'm home! I've been out of town on vacation! Good to be home and reading your blog again! I love those headbands! Wow, that story made me cry and cry. Wow! What a story. I just bought a headband for myself and 2 for my niece. : ) Thanks for sharing that with us. Thanks for sharing the headband info Katie. I'll be sending it around. That beautiful little girl up there is my 7 year old Princess, Tori. We are so honored to have a headband named after her, the Totally Tori. This is such a great organization, and as a mom of a bald little girl, it is so appreciated. Thank you for mentioning both Headbands of Hope and Tori's blog on your blog..I will deinitely be a reader!